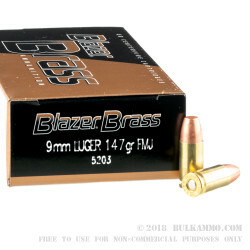 This 9mm cartridge from Blazer’s Brass line of ammunition has a 147 grain projectile. That’s as heavy a bullet as you’re likely to find in this caliber through traditional commercial means, and although many disparage the hefty bullet for performance in self-defense, it does a fine job ensuring that your shots will remain subsonic. A full metal jacket projectile isn’t ideal for self-defense anyway, but it will prevent bore fouling in your firearm in order to maintain its accuracy. Very nicely, this bullet’s base is protected -- that means the lead in its core won’t be exposed to hot propellant gasses, and accordingly won’t create many toxic fumes for you to breathe in while firing. 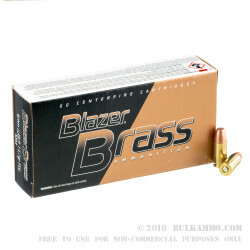 You’re likely already familiar with Blazer for their distinctive aluminum cased ammunition, which we wholly recommend. 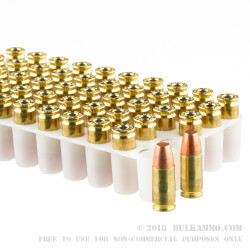 Still, many shooters won’t have anything to do with ammo that they can’t enjoy at their reloading bench just as well as they would at the range. 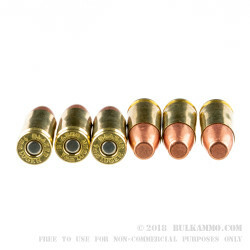 If that describes you, then you’ll approve of this round’s high quality brass casing, which is strong enough to withstand being fired multiple times, and which is primed with CCI’s very best to boot.